Goal attainment has been found to be associated with positive emotions (Snyder et al, 1996), whereas goal blockages are related to negative emotions (Diener, 1984); however this is not always the case. High hope individuals do not react in the same way to barriers as low hope individuals, instead they view barriers as challenges to overcome and use their pathway thoughts to plan an alternative route to their goals (Snyder, 1994 as cited in Snyder, 2000 p. 10). High hope has been found to correlate with a number of beneficial constructs including, academic achievement (Snyder et al, 2002) and lower levels of depression (Snyder et al, 1997). Meanwhile low hope is associated with negative outcomes including a reduction in well-being (Diener, 1984). Researchers have developed measurement tools that assess levels of hope as well as agency and pathway thoughts. But what are the purposes of such assessments? Snyder, (1995) has suggested several uses, including predicting outcomes among a sample and providing extra support for those who are low in hope, (e.g. in an educational setting where hope has been identified as predicting achievement). The first assessment tool designed to measure hope in respect of Snyder’s theory was the Adult Dispositional Hope Scale (ADHS) (Snyder et al, 1991). This scale taps into dispositional hope in adults aged over 15 years. It is a self report questionnaire that contains twelve questions, four that tap agency thoughts (e.g. Q2. I energetically pursue my goals), four that tap pathways thoughts (e.g. Q1. I can think of many ways to get out of a jam). Items are scored on an eight point Likert scale. The scale creates three scores, a hope score that is created by summing the agency and pathway items or two separate scores that measure agency and pathways independently by totalling their respective items. Total hope scale scores range from a minimum of 8 to a maximum of 64, while agency and pathway scores range from a minimum of 4 and a maximum of 32 with high scores reflecting high levels of hope (Snyder et al, 1991). Snyder and colleagues have used the ADHS in a number of different populations including American undergraduates, patients seeking psychological treatment and war veterans who suffer from post traumatic stress disorder. Lopez, Ciarlelli, Coffman, Stone & Wyatt, (2000) report the average hope scale score is 48, however when comparing the undergraduates with the clinical sample Snyder et al, (1991) found that clinical samples had a significantly lower mean hope score, although their mean score was still towards the hopeful end of the response scale. The ADHS has demonstrated extremely good levels of reliability with Snyder et al, (1991) reporting Cronbach alphas of .74 to .84 for overall hope, .71 to .76 for agency thoughts and .63 to .80 for pathway thoughts when sampling student and clinical populations. Further evidence to support the reliability of this scale is demonstrated by the test-retest statistics, which Snyder et al, (1991) reports as being .80 or above for time periods of up to 10 weeks when sampling student populations, no test-retest statistics are available for non-student populations. Factor analysis techniques have been employed to assess the assumption that hope is indeed made up of two factors as hypothesised by Snyder’s model of hope. Results support the presence of two distinct factors as agency items loaded heavily on factor one but not on factor two, while pathway items loaded heavily on factor two but not on factor one. Only one exception to this was discovered with one pathway item loading more heavily on the agency factor in a sample of clinical patients. These two factors were found to explain 52% and 63% of the variance in hope scores among the sample. Furthermore scree plot analysis revealed eigenvalues of less than 1.0 for the factors extracted past the agency and pathway factors, which supports the two factor model of hope (Snyder et al, 1991). It is also hypothesised that although agency and pathways are distinct components they are linked and this is supported by Snyder et al, (1991) who found significant positive correlations at the .001 level between the agency and pathway components. Another method used to assess the validity of a scale is to assess the correlations that occur with scales that tap constructs that are either similar, opposite or unrelated. Scores on the ADHS are positively correlated with scores on the Life orientation test (Scheier & Carver, 1985), negatively correlated with scores on the Hopelessness Scale, (Beck et al, 1974) and unrelated to the Self Consciousness Scale (Fenigstein, Scheier & Buss, 1975) thus supporting the convergent and discriminant validity of this scale. Criticisms of this scale have been discussed by Carver & Scheier, (2002) who have expressed doubt that three out of the four agency items tap agency thoughts and propose that they measure confidence/optimism. Shorey, Snyder, Rand, Hockemeyer & Feldman, (2002) have responded to these criticisms by highlighting the preliminary research carried out in which interviewees cited the three agency items as examples of what they say to themselves to get themselves motivated. Secondly Snyder, Lapointe, Crowson & Early, (1998) cite research evidence to show that high hope people prefer listening to these agency items and report that these items provide an accurate description of how they think about their goal motivation. Furthermore the four agency items have held together in terms of factor analysis on over 40 studies, suggesting that the four agency items do join together to form one common factor (Shorey et al, 2002). One drawback to the ADHS (Snyder et al, 1991) is that it only taps into trait hope, which means it only measures an individual’s general or characteristic level of hope. Hope levels may fluctuate depending on specific circumstances, (e.g. a high hope individual may experience low levels of hope when faced with a major stressor) and so an instrument that measures hope levels in a given set of circumstances would prove useful. As a result of this drawback Snyder et al, (1996) developed the Adult State Hope Scale (ASHS), which assesses goal directed thinking in any given moment or situation (Lopez et al, 2000). 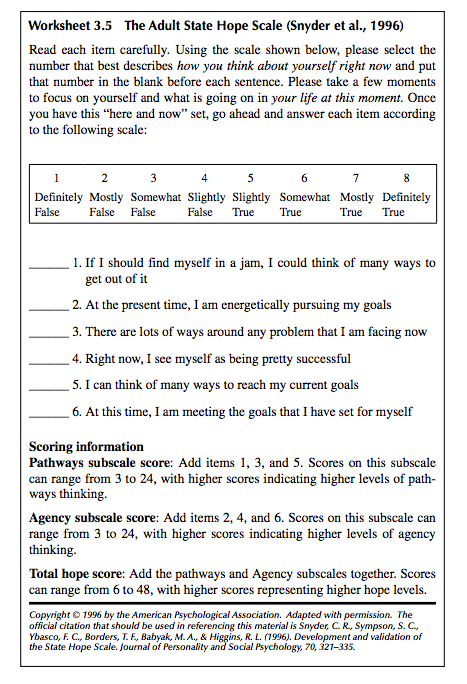 This scale is a six item self report questionnaire that is designed to tap into state hope in adults. The scale has three agency items (Q6. At this time, I am meeting the goals that I have set for myself) and three pathway items (Q5. I can think of many ways to reach my current goals). Items are scored using an 8 point Likert scale and scores are created for overall hope by summing all the items and by summing the even numbered items to get an agency score and all the odd-numbered items to get a pathway score. Total hope scores range from 6 to 48 and subscale scores range from 3 to 24 with high scores representing high hope (Snyder et al, 1996). No descriptive statistics are reported for the ASHS as it is not fitting to talk about norms with this scale as the scores fluctuate depending on circumstances. Snyder et al, (1996) tested the reliability of this scale in four studies that sampled 444 American students. The authors found Cronbach alphas of .79 to .95 for the overall state hope scale, .79 to .95 for the agency sub scale and .59 to .93 for the pathway subscale thus demonstrating strong support for the internal reliability (Lopez et al, 2000). Furthermore they found test-retest correlations of between .48 and .93 when comparing any two days in a month long study. Note that test-retest correlations should in this instance vary due to the fact it is measuring state hope rather than trait hope. Factor analysis was carried out by Snyder et al, (1996) who found support for the two factor structure hypothesised in Snyder’s hope theory. They found that the first two factors had eigenvalues above 1.0 and together accounted for 67.2% of the variance. However it must be noted that one agency item (“I am well prepared to handle what is currently happening in my life”) loaded more strongly on the pathway factor and so it was eliminated from the questionnaire. In order to create equal amounts of agency and pathway items, the pathway item with the lowest average factor loading was also eliminated. It is hypothesised that state hope scores should fluctuate over time depending on circumstances, but they should not deviate substantially from scores on the ADHS as Snyder et al, (1996) have theorised that dispositional hope has an upper and lower range and within this range state hope should fall. This hypothesis was supported as correlations of .79 were observed between scores on state hope and scores on dispositional hope. Finally scores on the ASHS were positively correlated with scores on the State Self Esteem Scale (Heatherton & Polivy, 1991) and the positive affectivity scale of the PANAS Scale, while negative correlations were observed with the negative affectivity subscale of the PANAS (Watson, Clark & Tellegen, 1988) thus supporting the construct validity of the scale (Lopez et al, 2000). A further shortcoming of the ADHS (Snyder et al, 1991) and the ASHS (Snyder et al, 1996) is that they measure general hope that is not independent of different life domains. A person may be high in hope in relation to their career but have low hope in relation to relationships. In this case the dispositional or state hope measures discussed above would fail to pick up upon the discrepancies that manifest in this persons hope profile. As a result of this Sympson, (1999 as cited in Lopez et al, 2000, p.61-63) has developed the Adult Domain Specific Hope Scale (DSHS) that measures an individual’s level of dispositional hope in six specific areas, which are social, academic, family, romance/relationships, work/occupation and leisure activities (Lopez et al, 2000). This scale is made up of 48 items, (8 for each domain) that are scored on an 8 point Likert scale. The total hope score is calculated by summing all 48 items and ranges from a minimum of 48 to a maximum of 384. Whereas domain specific hope scores are calculated by summing the eight items within each domain, scores range from 8 to 64 with high scores indicating high levels of hope (Sympson, 1999 as cited in Lopez et al, 2000, p.61-63). Descriptive statistic’s are reported for a sample of 343 undergraduates by Sympson, (1999 as cited in Lopez et al, 2000, p.61-63) who reports that the mean domain specific hope score is 302.88 while the domain sub scales range from a low of 43.66 for romantic hope and a high of 53.67 for work hope. The reliability of the DSHS is supported as Sympson, (1999 as cited in Lopez et al, 2000, p.61-63) found Cronbach alphas of .93 for overall hope and alphas ranging from .86 to .93 for the domain specific hope. Currently the test-retest reliability has not been studied in relation to this scale (Lopez et al, 2000). The existence of six separate hope domains is supported by factor analysis techniques Sympson, (1999 as cited in Lopez et al, 2000, p.61-63) although the data is unavailable for critique as this scale is an unpublished doctoral dissertation cited in Lopez et al, (2000). The concurrent construct validity of the DSHS is supported by the positive correlations that occurred between all of the six domains and related constructs, e.g. the family subscale scores correlated positively with scores on the perceived social support from family scale (Prociando & Heller, 1983). Meanwhile overall hope scores were negatively correlated with the Revised UCLA Loneliness Scale (Russell, Peplau & Cutrona, 1980). There are several criticisms of hope theory and its measurement that can be applied to all of the questionnaires assessed so far. Firstly the validation of hope measures relies too heavily on American undergraduate samples, which limits the representativeness of the results. High hope in developed countries such as America may be easier to achieve than in third world countries. On the other hand it may be that hope levels remain the same no matter what situation an individual is in, rather the goals you aim for differ, (for example an individual in the U.S.A may have the goal of going to university while an individual in the third world may have the goal of providing food for their family). One study that has attempted to look at diverse racial and ethnic groups in relation to hope theory found no strong evidence to suggest that ethnic minority American’s experienced lower levels of hope than non-ethnic minority American’s (Chang & Banks, 2007). Although this study still relied on an American college sample. America is referred to as the ‘land of opportunity’ and the concept of the ‘American dream’ may mean that the ethnic minority groups who moved to the U.S.A. were higher on hope than those who remained in their home countries. Thus the second generation ethnic minority students who are sampled in the above study may be higher in hope as they come from high hope families. Further research is required to assess hope in non-American samples. Secondly the over reliance on undergraduate samples means the population studied is made up of young participants and this limits our understanding of hope across the ages. This is especially relevant today as the population is ageing. Older adults may face many barriers to hope such as declining physical health or the loss of significant others (Cheavens & Gum, 2000). These factors may lead to a reduction in hope, however some high hope older people may be able to continue hopeful thinking in the face of these barriers and it would be useful to study this process. Other measures of hope have also been designed to tap Snyder’s agency and pathway model of hope. Snyder et al, (1997) have created the Children’s Hope Scale, which is designed to measure hope in children aged 7 to 16 while McDermott, Hastings, Gariglietti & Callahan, (1997, as cited in Lopez et al, 2000, p. 65-67) have developed the Young Children’s Hope Scale that assess hope in children aged 5 to 7. Due to space restrictions these measures cannot be assessed in full but both have good levels of reliability and validity (Lopez et al, 2000). All the measures considered so far have been quantitative in nature but researchers have developed qualitative tools that measure hope. Observation techniques have been derived from the Adult Hope Scale, Children’s Hope Scale and the Young Children’s Hope Scale by adapting the wording to a third person narrative. Preliminary results suggest a moderate correlation between self report Young children’s Hope scale scores and observer scores (Lopez et al, 2000). A Hope interview with questions relating to general hope, goals, agency thoughts, pathway thoughts and barriers has also been developed (Lopez et al, 2000). Interview questions such as “When faced with a difficult problem, how do you react?” enable a therapist to assess a client’s level of hope and spot discrepancies in agency and pathway processes. Narrative approaches can also be used to asses levels of hope in letters, diaries etc. Vance, (1996 as cited in Lopez et al, 2000) has developed a Narrative Hope Scale that provides a framework for determining the levels of overall hope, agency or pathway thoughts, although validation is still required for this scale. In conclusion hope can be measured using quantitative measures that cover the main types of hope, (e.g. trait, state and domain specific) in all age groups. The adult scales and the children’s scales all have strong internal reliability; however they could be improved by sampling more diverse populations as hope may a luxury that those in the western world have access to. Quantitative measures are less developed and require further study to improve the correlations between an individual’s hope score and an observer’s hope rating. Beck, A.T., Weissman, A., Lester, D., & Trexler, L. (1974). The measurement of pessimism: The Hopelessness Scale. Journal of Counselling and Clinical Psychology, 42, 861-865. Carver, C.S., & Scheier, M.F. (2002). The Hopeful Optimist. Psychological Inquiry, 13 (4), 276-321. Chang, E.C., & Banks, K.H. (2007). The Colour and Texture of Hope: Some Preliminary Findings and Implications for Hope Theory and Counseling Among Diverse Racial/Ethnic Groups. Cultural Diversity and Ethnic Minority Psychology, 13 (2), 94-103. Cheavens, J., & Gum, A. (2000). Gray Power: Hope for the Ages. In C.R. Snyder (Eds. ), Handbook of Hope Theory, Measures and Applications (pp.201-221). San Diego: Academic Press. Fenigstein, A., Scheier, M.F., & Buss, A.H. (1975). Public and private self-consciousness: Assessment and theory. Journal of Consulting and Clinical Psychology, 43, 522-527. Lopez, S.J., Ciarlelli, R., Coffman, L., Stone, M., & Wyatt, L. (2000). Diagnosing for Strengths: On Measuring Hope Building Blocks. In C.R. Snyder (Eds.). Handbook of Hope Theory, Measures and Applications (pp.57-85) San Diego: Academic Press. McDermott, D., Hastings, S.L., Gariglietti, K.P., & Callahan, B. (1997). The development of the Young Children’s Hope Scale. Unpublished manuscript, University Kansas, Lawrence. Cited in Lopez, S.J., Ciarlelli, R., Coffman, L., Stone, M., & Wyatt, L. (2000). Diagnosing for Strengths: On Measuring Hope Building Blocks. In C.R. Snyder (Eds.). Handbook of Hope Theory, Measures and Applications (pp.57-85) San Diego: Academic Press. Prociando, M.E., & Heller, K. (1983). Measures of perceived social support from friends and family: Three validation studies. American Journal of Community Psychology, 111, 1-23. Scheier, M.F., & Carver, C.S. (1985). Optimism, coping and health: Assessment and implications of generalised outcome expectancies. Health Psychology, 4, 219-247. Shorey, H.S., Snyder, C.R., Rand, K.L., Hockemeyer, J.R., & Feldman, D.B. (2002). Somewhere Over the Rainbow: Hope Theory Weathers Its First Decade. Psychological Inquiry, 13 (4), 322-331. Snyder, C.R. (1994). The psychology of hope: You can get there from here. New York: Free press. Cited in Snyder, C.R. (2000). Hypothesis: There is Hope. In C.R. Snyder (Eds. ), Handbook of Hope Theory, Measures and Applications (pp.3-21). San Diego: Academic Press. Snyder, C.R. (1995). Conceptualising, measuring and nurturing hope. Journal of Counseling and Development, 73, 355-360. Snyder, C.R. (2000). Hypothesis: There is Hope. In C.R. Snyder (Eds. ), Handbook of Hope Theory, Measures and Applications (pp.3-21). San Diego: Academic Press. Snyder, C.R., Harris, C., Anderson, J.R., Holleran, S.A., Irving, L.M., Sigmon, S.T., et al. (1991). The Will and the Ways: Development and Validation of an Individual-Differences Measure of Hope. Journal of Personality and Social Psychology, 60 (4), 570-585. Snyder, C.R., Hoza, B., Pelham, W.E., Rapoff, M., Ware, L., Danovsky, M., et al. (1997). The Development and Validation of the Children’s Hope Scale. Journal of Pediatric Psychology, 22 (3), 399-421. Snyder, C.R., Irving, L., & Anderson, J.R. (1991). Hope and Health: Measuring the will and the ways. In C.R. Snyder & D.R. Forsyth (Eds.) Handbook of social and clinical psychology: The health perspective (pp.285-305). Elmsford, New York: Pergamon Press. Cited in Snyder, C.R. (2000). Hypothesis: There is Hope. In C.R. Snyder (Eds. ), Handbook of Hope Theory, Measures and Applications (pp.3-21). San Diego: Academic Press. Snyder, C.R., Lapointe, A.B., Crowson, J.J., Jr., & Early, S. (1998). Preferences of high-and low-hope people for self referential feedback. Cognition and Emotion, 12, 807-823. Snyder, C.R., Shorey, H.S., Cheavens, J., Pulvers, K.M., Adams, V.H., & Wiklund, C. (2002). Hope and Academic Success in College. Journal of Educational Psychology, 94 (4), 820-826. Snyder, C.R., Sympson, S.C., Ybasco, F.C., Borders, T.F., Babyak, M.A., & Higgins, R.L. (1996). Development and Validation of the State Hope Scale. Journal of Personality and Social Psychology, 70 (2), 321-335. Sympson, S. (1999). Validation of the Domain Specific Hope Scale: Exploring hope in life domains. Unpublished doctoral dissertation, University of Kansas, Lawrence. Cited in Lopez, S.J., Ciarlelli, R., Coffman, L., Stone, M., & Wyatt, L. (2000). Diagnosing for Strengths: On Measuring Hope Building Blocks. In C.R. Snyder (Eds.). Handbook of Hope Theory, Measures and Applications (pp.57-85) San Diego: Academic Press. 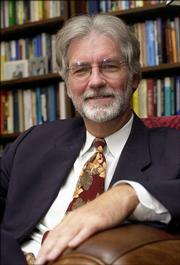 Vance, M. (1996). Measuring hope in personal narratives: The development and preliminary validation of the Narrative Hope Scale. Unpublished doctoral dissertation, University of Kansas, Lawrence. Cited in Lopez, S.J., Ciarlelli, R., Coffman, L., Stone, M., & Wyatt, L. (2000). Diagnosing for Strengths: On Measuring Hope Building Blocks. In C.R. Snyder (Eds.). Handbook of Hope Theory, Measures and Applications (pp.57-85) San Diego: Academic Press.